All transactions are safe and secure with a reliable history in online purchasing behind each of our associates. 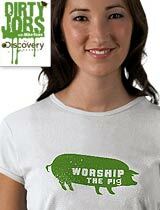 Buy the Worship the Pig t-shirt to own Dirty Jobs clothing and merchandise. This bestselling Worship the Pig design is a great get dirty tee that is the perfect gift for fans of the Discovery Channel Dirty Jobs TV show. The front of the tee reads, "Worship the pig," with a silhouette of a pig, while the back displays the TV series and network logos, which appear on most styles. Discovery Channel host Mike Rowe often leaves his handprint on the jobsite after completing various messy tasks. Similarly, a pig-print has been left on this apparel item. This Dirty Jobs t-shirt design is available on both men's and women's apparel styles. In addition to the Worship the Pig tee above, browse the Dirty Jobs Clothing Gallery for more apparel like men's and women's clothes, kids shirts or hoodies.